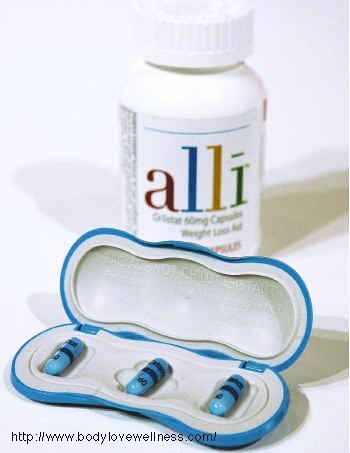 The weight loss drug Alli Orlistats is used by people who wish to lose weight without consulting a doctor. Anyone who takes this drug can have a reasonable expectation that treatment is not likely to result in serious harm. To get the most use out of Alli Orlistat, it is important to read all package directions and follow them accordingly. The drug Alli Orlistat acts by turning fat into a form that is more easily expelled from the body. This means that one of the most common effects of taking the drug is creating gastrointestinal discomfort in the form of excessive bowel movements and similar problems. When taking Alli Orlistats, you should be prepared to experience discomfort during the initial weeks and months of ingestion. Several reactions indicate that you should not continue taking this drug. After beginning to take Alli Orlistats, you may begin itching or notice dark urine. These are cautionary signs that this drug may be causing liver damage. You should consult a physician immediately if this occurs once you have begun a course of treatment of Alli Orlistat. The drug can be taken indefinitely without fear of serious adverse effects. Current testing and safety information gives no indication that long-term use of Alli Orlistats is likely to lead to long-term information. Even the cases of liver damage which have been recorded are relatively uncommon. Nonetheless, it is important to read the intake directions carefully to ensure that you do not overuse the drug. Ingesting Alli Orlistats is not effective unless you are maintaining an appropriate diet. Deriving the most benefit from a course of Alli Orlistat will require you to eat no more than 15 grams a day. Determining the most beneficial diet to accompany Alli Orlistats may require nutritional experimentation and adjustments. The manufacturer offer online guidance for patients new to Alli Orlistat to help them monitor these changes in their nutrition. Alli Orlistat cannot result in overdose or shock in most cases. However, you should not take Alli Orlistats if you have had pancreatic medical problems or allergic reactions to its component ingredients. If you decide to discontinue Alli Orlistat use, you should not be concerned about potential withdrawal effects. Taking this drug can be done with confidence in its safety provided you immediately report unexpected symptoms to a doctor. If adverse effects which are not sufficiently documented in the manufacturer's information occur, you may have grounds for a lawsuit. Maintain receipts documenting your purchase of Alli Orlistats, which can help establish your use of this drug. A lawyer will need to demonstrate a direct correlation between this intake and subsequent health effects. Do not attempt self-representation in such matters. If you have been seriously medically affected by taking this drug, you should consult with a lawyer as soon as possible to ensure you do not take action past your state's statute of limitations. Such complicated matters are best handled by an experienced lawyer who understands the burden of proof that exists to advance litigation.